"When you receive any blessing from God, you can conclude that you have complied with an eternal law governing reception of that blessing. (See D&C 130:20–21.) But remember that the 'irrevocably decreed' law is time insensitive, meaning blessings come on God’s timetable. 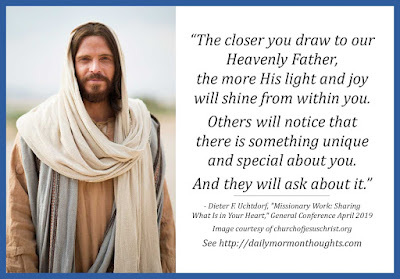 Even ancient prophets in search of their heavenly home (see Hebrews 11:16) 'died in faith, not having received the promises, but having seen them afar off … [and] were persuaded … and embraced them.' (Hebrews 11:13) If a desired blessing from God has not been received—yet—you do not need to go crazy, wondering what more you need to do. 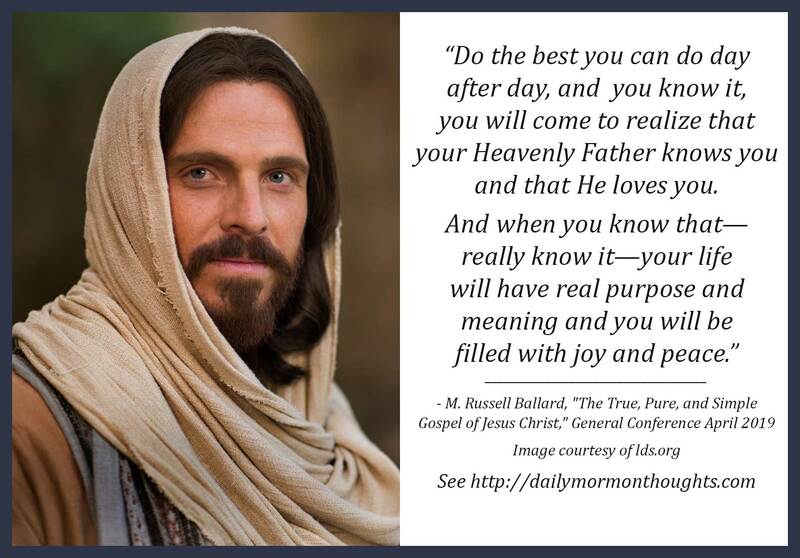 Instead, heed Joseph Smith’s counsel to 'cheerfully do all things that lie in [your] power; and then … stand still, with the utmost assurance, to see the … arm [of God] … revealed.' (D&C 123:17.) Some blessings are reserved for later, even for the most valiant of God’s children." 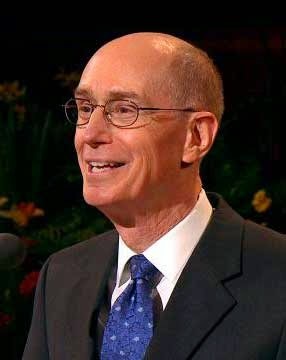 Elder Renlund shared an interesting consideration about blessings from God, and the relationship between His willingness and eagerness to bless us, and our actions in righteousness and obedience that might qualify us for those blessings (but do not constitute "earning" the blessings). A critical lesson in life is that "blessings come on God’s timetable." We can never set the expectations and the timing; we are never aware of all the factors involved. Our role is to believe, have faith, and trust in His wisdom. We must never lose faith in God's wisdom and in His timing. And we must never cease to be truly and deeply grateful for any blessing that we receive. 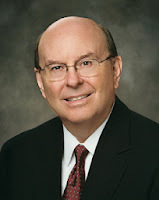 Labels: blessings, faithfulness, grace, obedience, Renlund Dale G.
Elder Gary E. Stevenson (born August 5, 1955) was called as a Seventy in 2008, then as Presiding Bishop in 2012. He was called as a member of the Quorum of Twelve Apostles in October 2015. "Great coaches know the strengths and weaknesses of their team as well as those of the opposition. They create a game plan that will give them the best chance for victory. What about you? "You know what temptations you are most vulnerable to, and you can predict how the adversary will try to derail and dishearten you. Have you created a personal game plan and playbook so that you will know how to respond when faced with opposition? "As you confront various moral temptations—whether in the company of others or when you are alone staring at a screen—you know your game plan. If a friend suggests you drink alcohol or try drugs, you know the play. You have practiced and know how to react in advance. "With a game plan, a playbook, and a firm commitment to execute your role, you will find that temptation has less control over you. You will have already made the decision of how you will react and what you will do. You won’t need to decide every time you are confronted with temptation." 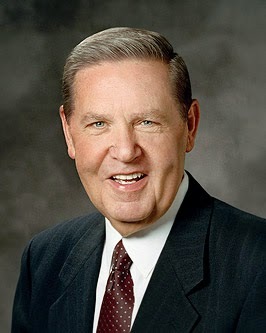 Elder Stevenson used a familiar analogy to teach a concept that has been shared in a number of ways: the importance of establishing, in advance, how we will react to challenging situations, even practicing the reaction, and committing to that plan when the challenge arises. The idea of having a "game plan" for life, with a specific "play book" describing the actions and scenarios, will ring true to many youth and to adults as well. The more explicit and detailed we are able to anticipate in those scenarios and our response, the more successful we will be in carrying out our plan. I liked the point that we each know what are greatest vulnerabilities are and where we need to focus our greatest efforts in anticipation. Those temptations will come, and the better our preparation, the more likely we will be to succeed. 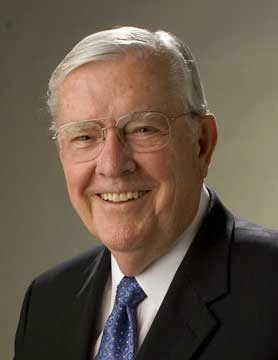 Decisions and commitments made in advance have great power if our commitment to them is strong and whole-hearted. In effect, Satan is bound (D&C 45:55), since we allow him no access to our hearts. 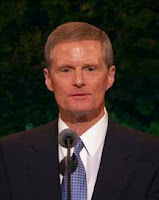 Elder Ronald A. Rasband (born February 6, 1951) served as a Seventy beginning in 2000. 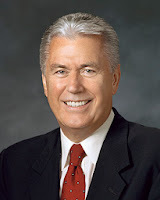 He was the senior president of the Seventy when he was called to the Quorum of Twelve Apostles in October 2015. 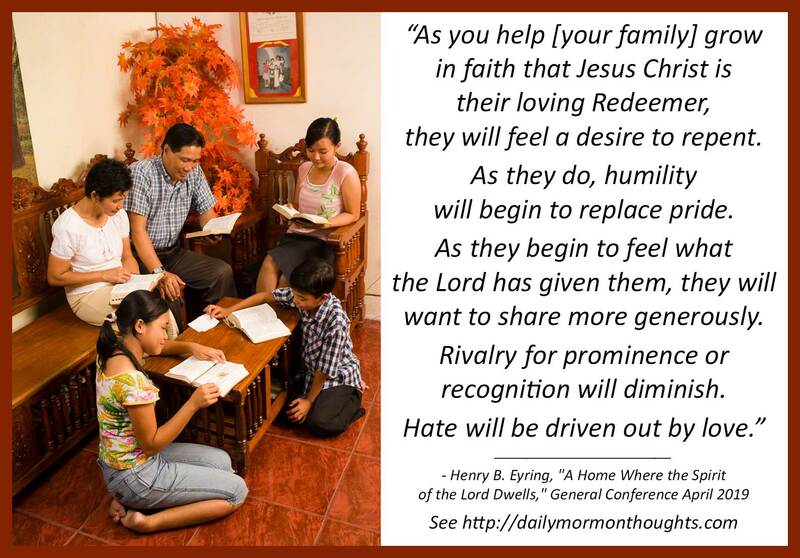 This talk was given in a General Priesthood session of conference when he was serving as a Seventy. "Brothers and sisters, we are at war with Satan for the souls of men. The battle lines were drawn in our pre-earth life. Satan and a third of our Father in Heaven’s children turned away from His promises of exaltation. Since that time, the adversary’s minions have been fighting the faithful who choose the Father’s plan. "Satan knows his days are numbered and that time is growing shorter. As crafty and cunning as he is, he will not win. However, his battle for each one of our souls rages on. "For our safety, we must build a fortress of spirituality and protection for our very souls, a fortress that will not be penetrated by the evil one. "When we build a fortress of spiritual strength, we can shun the advances of the adversary, turn our backs on him, and feel the peace of the Spirit. We can follow the example of our Lord and Savior, who, when tempted in the wilderness, said, 'Get thee behind me, Satan' (Luke 4:8). We each have to learn by the experiences of life how to do that." It's not exaggerating to describe the present conflict between good and evil in the world as "war." The struggle is real, and prophets frequently warn us that Satan's "battle for each one of our souls rages on" and remind us of our need to be prepared and strong. The description of Satan as a "subtle snake" who can "[sneak] into our minds and hearts when we have let our guard down, faced a disappointment, or lost hope" is one that we should ponder. At the times when we are most vulnerable, we need to be the most cautious and the most committed to our spiritual fortifications. "It does not matter if we are rich or poor, prominent or unknown, sophisticated or simple. Rather, our mortal quest is to strengthen our faith in the Lord Jesus Christ, to choose good over evil, and to keep His commandments. While we celebrate the innovations of science and medicine, the truths of God go far beyond these discoveries. "With the Restoration of the gospel, God has given us the way to learn and know essential spiritual truths: we learn them through the holy scriptures, through our personal prayers and our own experiences, through the counsel of the living prophets and apostles, and through the guidance of the Holy Ghost, who can help us to 'know the truth of all things' (Moroni 10:5)." All mankind has the same quest in mortality: to choose to follow God, obey His commandments, and draw close to Him. But there is great opposition to our achieving that quest. The adversary with all his tools and tricks will endeavor to dissuade us from the path. From the beginning of time, he has been diligent in fighting against God's plan. It becomes ever more important for us to fortify ourselves and prepare for the challenges. Great keys to our gaining the spiritual knowledge that will prepare us for the future are in the fundamental behaviors that are commonly taught: scripture study, personal prayer, following inspired counsel, and seeking the promptings and companionship of the Holy Ghost. These things seem so obvious to us, but they have never been more important than now. We would each do well to evaluate and recommit. "Jesus suffered deeply because He loves us deeply! He wants us to repent and be converted so that He can fully heal us. "When sore trials come upon us, it’s time to deepen our faith in God, to work hard, and to serve others. Then He will heal our broken hearts. He will bestow upon us personal peace (see John 14:27) and comfort (see Isa 40:1; John 14:16-17, 26). Those great gifts will not be destroyed, even by death. "The gift of resurrection is the Lord’s consummate act of healing. Thanks to Him, each body will be restored to its proper and perfect frame (see Alma 11:43; Alma 40:23). 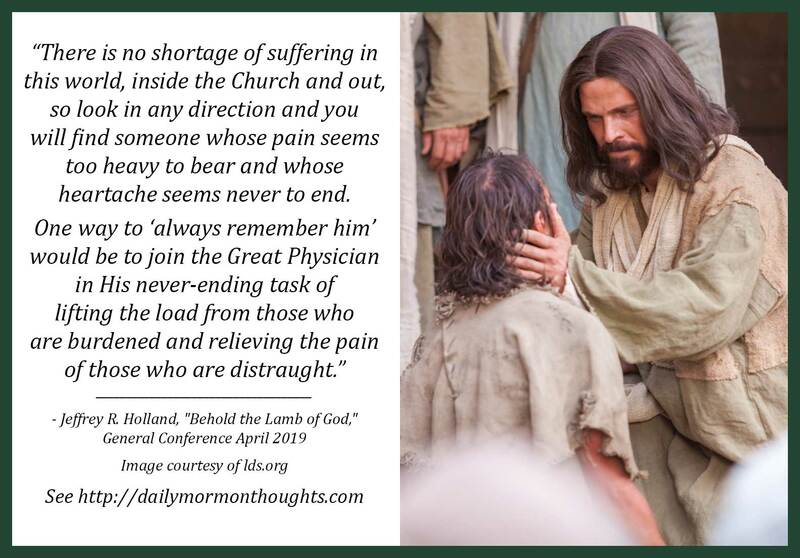 Thanks to Him, no condition is hopeless. Thanks to Him, brighter days are ahead, both here and hereafter. Real joy awaits each of us—on the other side of sorrow." This is a beautiful message for Easter morning. All of us suffer in life, to some degree and on some occasions; some more than others, for reasons we don't always understand. 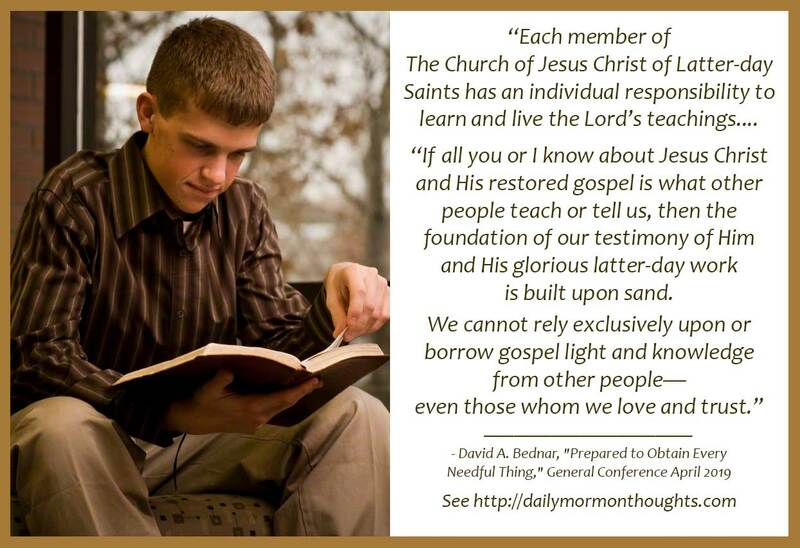 But gratefully, the Savior suffered too; he "suffered deeply because He loves us deeply!" Because of that love, He offers us healing as we repent and turn to him. Our broken hearts can be replaced by personal peace through His grace and atonement for us. Through His resurrection He offers to us the "consummate act of healing." All physical ailments and disabilities will be resolved; and through the Atonement, all spiritual and emotional concerns can also be healed. What a glorious and hope-filled gift! 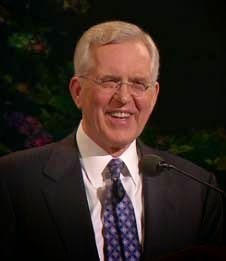 Truly, there is "real joy" waiting us all "on the other side of sorrow." "This precious Son, our Lord and Savior, atoned for our sins and the sins of all. That memorable night in Gethsemane His suffering was so great, His anguish so consuming that He pleaded, 'Father, if it be possible, let this cup pass from me: nevertheless not as I will, but as thou wilt.' (Matt. 26:39) Later, on the cruel cross, He died that we might live, and live everlastingly. Resurrection morning was preceded by pain, by suffering in accordance with the divine plan of God. Before Easter there had to be a cross. The world has witnessed no greater gift, nor has it known more lasting love." Easter is the commemoration of "the ultimate expressions of true love." In this beautiful conference address, President Monson taught us of the giving of gifts in general, but concluded with this powerful reminder of that ultimate gift given by the Father and by the Son. God loved the world so much that he offered His Son; and the Son loved so much that He offered His life. Because of those gifts, everything that is most precious and dear in the world is available to us. How grateful we should be to commemorate this glorious gift of love on Easter. And how faithful we should be to that gift and message throughout the year! "What can we do to prepare now for that day? 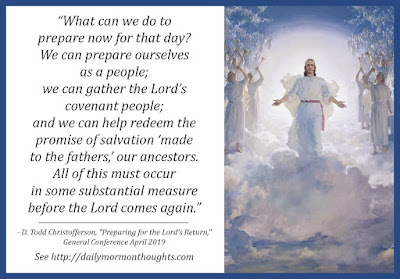 We can prepare ourselves as a people; we can gather the Lord’s covenant people; and we can help redeem the promise of salvation 'made to the fathers,' our ancestors. (D&C 2:2) All of this must occur in some substantial measure before the Lord comes again." To "prepare now as a people" includes the aspects of reaching out to one another in love, helping to strengthen and bless as we minister to one another. 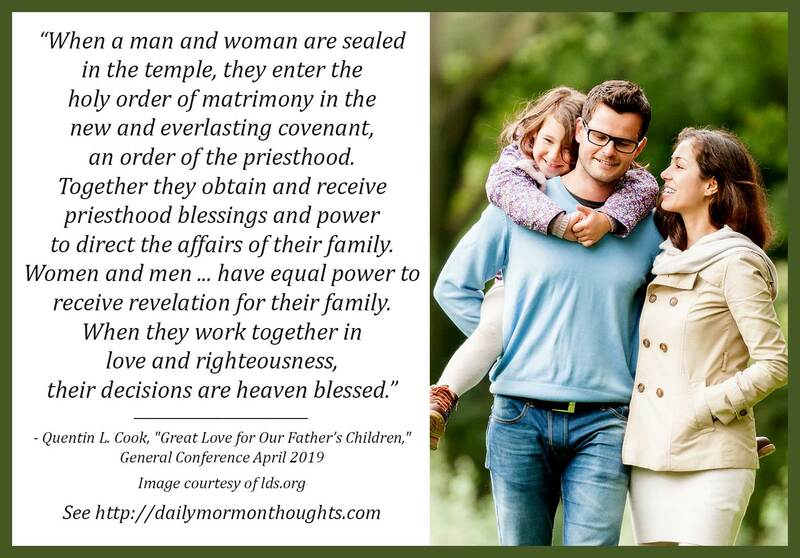 Through missionary service we assist in gathering others into the fold; and through efforts in family history and temple service we help to redeem our ancestors. These "three-fold" actions are not new, but our resolve to do better can be renewed!